You are currently browsing the category archive for the ‘EWRadar’ category. Oops, EWR is offline for a bit due to an expired domain – will be back on the DNS servers shortly. If you’ve come here from EWRadar’s #BootsandHearts weather updates, head to [this page] to go to our Boots and Hearts live radar feed With support from the Weather Channel and Environment Canada. Canadian Tire Mosport Park (“Boots and Hearts”) is located just NE of map centre. Quick guide – green – overcast to light rain. Yellow – moderate to heavy rain, light thundershower. Red – heavy rain, moderate to severe thunderstorm. Pink, purple – take cover! Have a great weekend – wish I was there! Important notice to users: Update to Ephemerata Weather Radar server re-configuration is on schedule. Update 2012-12-18: The hosting arrangement for imaging turned out to be a fairly simple fix, thanks to sync’d cloud hosting. EWR is now fully back up and running (some secondary html pages may still need to be recoded for urls – these will take a while to trace out). We also took the opportunity to upgrade ISP speed by nearly 50%, which should reduce the occasional blockup due to polling collisions between the various program iterations running. We have a RAM upgrade coming for the main computer as well, which will likely be done sometime over the Christmas holidays. Update 2012-12-15: While there remains a lot of code cleanup yet to do, server re-configuration has gone quite smoothly and is nearly complete. Performance testing will be the order of the day for the next week or two. 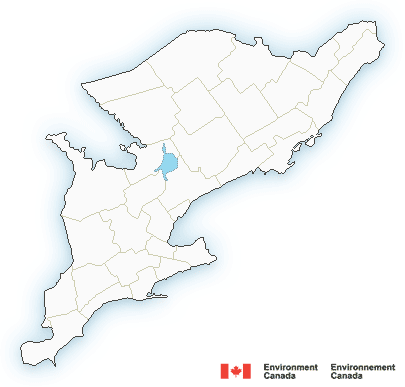 SW Ontario and Eastern Ontario alert systems still need to be recoded. Like most other website owners, EWR uses a third party hosting company to host the programs and data that users draw on. Yesterday, unannounced, our hosting company switched to Secure Socket Layer protocols across all of its platforms. This has had the effect of shutting down EWR, and the solution is not simple. EWR uses program-internal FTP protocols to upload its processed data to the web for use by others. This software does not have SSL functionality built into it. Temporarily, the hosting company has left a port open while we try to resolve this problem. Unfortunately, this solution also results in slow data retrieval from our domains, slow to an unacceptable level. Our solutions are not trivial. We either have to change hosts, or look to changing how we get the data to the web. At present the software author has not indicated a willingness to address the problem from within the analysis programs, which may mean trying to use third party SSL FTP programs to move the data files. This introduces timing issues with regard to currency of the data available to users. For a functionality based on timely alerting of severe weather, this is extremely problematic, and since we coordinate this data flow over several simultaneous iterations of the programs and over several computers, the challenge to rebuild the functionality, appears, at the moment, to be huge. Malware issues are the driver behind the hosting company’s changes, so simply changing hosts may only turn out to be a short term band-aid. Since EWR is a non-profit operation, there may be no quick fix. Consideration may be given to direct hosting on our own servers, but that is expensive and has a much high maintenance cost, and will not be a quick installation if we go that route. The continued operation of Ephemerata Weather Radar is presently in doubt. Three years of development work has gone into integating EWR over several machines, social networks such as Twitter, and direct email alerting of subscribers. For those of you who use EWR regularly, we apologize for the imminent loss of functionality. Truly, today, I do not know if the Ephemerata Weather Radar Project has come to an end. I’ve added a Twitter account for the EWR Blog, EWRadar, as distinct from the Twitter account EWRWxAlert so that posts from the EWR blog pages will now auto-post to twitter. The EWRWxAlert.ca pages will remain focused on tweeting out the alerts, so that followers are not cluttered by tweets unrelated to specific severe weather events. Also, this hurricane season, I’m separating out specific named-storm information into their own EWR blog posts (see Tropical Storm Debby) rather than embedding the information in the general season overview at Atlantic and Eastern Pacific Hurricane Activity 2012. The overview post continues its previous functions, linking to the named-storm posts rather than having the information embedded. This will make tracking and archiving specific storm info easier and reduce the clumsiness in the overview post when multiple named storms are in play. KBUF to be down until April 6th, 2012 for Dual Polarization Upgrade, So will be EWR severe wx alerts…. Hopefully the weather will behave this week – this puts the GH-GTA severe weather alert system off air until they return to service. I’ve increased the size and coverage area of the Scan B displays on the Ephemerata Weather Radar main page. Coverage is still dependent on the range of the four radar sites I use for the southern Ontario sweeps, as does the particular VCP mode used (VCP modes are a set of sweep algorithms the radar dish follows, along with specific processing, in order to achieve certain information and display characteristics. The interpretation notes on the main page talk about VCPs). Previously, the B scans displayed the Composite Reflectivity sweep as the native display, and if you clicked on the display, the display switched to the Base Reflectivity sweep. Update: The step-through click sequence for the available uploaded products has been replaced with a tablular selection array for each product EWR uploads (dependent on weather). This makes it easier to see what products are currently being uploaded, and to select the panels of interest. At a glance, you can see what uploads are active, and which are not. Additionally, several products may be available on an ad-hoc basis from the new dual-polarization capability of the radar system. These new products (Correlation Coefficient, Differential Reflectivity and Specific Diferential Phase) are extremely technical in nature, and are intended to be analysed in context with other scan products. I am including them in the new product arrays for those who are interested, but they will only be available when I am interrogating specific storms. Rather than clicking through, the click-returns now take you back to the arrays, or to the relevant main EWR page. This new arrangement also works better on tablets too. Composite Reflectivity (CR) – As its name suggests this is a composite of all reflectivity layers from the bottom scan to the top scan, and shows the total content of the complete sweep cycle. It is derived at the last scan, which can take several minutes to reach, therefore Composite Reflectivity is always a few minutes behind Base Reflectivity. CR is the general view that shows you how much water is distributed in the cloud deck. Base Reflectivity (BR1) – As its name suggests, Base Reflectivity shows the radar reflectivity in a single layer. Usually, the choice is for the 5 degree tilt, the first layer (BR1), as it looks at the cloud structure nearest to the ground. This is the choice for visualizing storm structure in the search for rotation and tornadoes. Composite reflectivity will hide these structures under the higher layers. If weather reports indicates the possibility of supercell formation with tornadic activity, this is the reflectivity scan to choose. BR1 comes up on the first click of the main page B scan image. This scan is the most current from the radar unit as the radar computers send out this data at the beginning of the scan set. When the HCA product (discussed below) is turned on, the BR1 screen will show the circular “melting layer” rings (see the dual-polarization echo type classification discussion further down the page for a discussion of melting layer). Storm Relative Velocity (SRV1) – Click on the BR1 image and you are taken to the Storm Relative Velocity screen SRV1 scan (click again and you are taken to the Base Velocity BV1 screen). Weather radars not only capture the reflected radar beam to tell you how much water is in the air, they can tell you how fast the water is moving in the air, through the use of Doppler time measurement (google it!). There are two velocity parameters, Base Velocity, and Storm Relative Velocity. Base velocity measures water movement velocity relative to the radar site itself, and will tell you something about the speed and direction of wind as felt on the ground. Storm Relative Velocity measures water movement within the storm, relative to the base velocity, not the ground. What this allows, is the visualization of rotation within a supercell, and will detect the motion and speed of tornadoes forming at the base of a supercell (supercells, by definition, contain rotating updraft columns, or “mesocyclones”). A potential tornado shows up as a close coupling of two colours from opposite ends of the scale, indicating winds moving in different directions very close together, as what happens in a tornado. The stronger and more tightly defined the couplet, the higher the probability that a tornado is forming at the layer level the radar sees. This doesn’t necessarily mean that a tornado has reached ground, only that very tight rotation is occurring at the cloud level visualized, from which a tornado may descend. Base Reflectivity BR1 and Storm Relative Velocity SRV1 are used together to interrogate a storm for tornadic possibility. Dual polarization Radar Echo Type Classification (HCA mode) – Click on the Storm Relative Velocity image (or click on continue if no image is present) and you’ll move to a new screen, the Dual polarization Radar Echo Type Classification screen for the selected radar site. Recent technological advances to the weather radar hardware now incorporate the ability of the radar sweep scan to sweep a vertically polarized beam as it sweeps horizontally around the sky. This “dual-polarization” echo signal, when coupled with sophisticated computer algorithms, allows, amongs other things, an estimate of the type of precipitation or radar target, that the radar site is seeing. Ordinary single polarization radar can’t distinguish rain from snow, for example. EWR is showing the “HCA” mode, which attempts to distinguish the nature of the echo target, and report it as a colour coded display according to a set of possible targets. Dual-pol, as its known for short, can do many things, including provide more sophisticated imaging of tornadic cells. This is leading-edge weather radar technology and is in its infancy still. Interpretation of the more sophisticated uses of dual-pol is beyond the scope of EWR’s presentations at the present time. Of the radar sites we monitor, all are dual-polarization capable except for KDTX, Detroit, which therefore does not have the HCA display in the sequence. As with the other sequenced displays, for bandwidth considerations, HCA is invoked when the weather conditions are appropriate to include it. It won’t necessarily be available at all times. Mousing over the legend scale below the image will bring up a chart of colour codes and indicators depicting how the radar system is interpreting the radar data. When turned on, the “melting layer” rings will also be evident. The ring circles indicate the “melting layer” – the vertical zone in the atmosphere where the precipitation changes state from frozen to liquid. The area between the thin yellow lines represents the vertical thickness of the radar beam as it crosses the melting layer – the inner yellow ring is where the top of the beam enters the melting layer, and outer yellow ring where the bottom of the beam exits the melting layer. The thicker white lines represent where the centre of the beam crosses through the melting layer. The widths of these areas between lines gives you an idea of the thickness of the melting layer. The HCA product determines what the state of the precipitation is within the beam. The farther the distance from the radar site the higher the beam is, and why the inner ring state of the HCA product may show one state, and the outer ring state show another (programmed that way). Therefore, beyond the outer white ring, the precipitation may not be, at the ground, what the HCA product indicates higher in the atmosphere. One Hour and Storm Total Precipitation are derived displays that estimate the amount and rate of rainfall that a storm cell is producing. One Hour rate (OHR) is an estimate of how much rain will fall in one hour, and Storm Total Precipitation (STR or DSP) is the estimated amount of total precipitation during the specific storm event. The STR display is reset by the radar operators to reflect discrete storm events. A one hour gap of no precipitation is the standard for resetting Storm Total Precipitation, but in practice the operators set different intervals depending on the duration of storm events. The visual graphical representation of weather that you see on computer and TV weather displays starts out as a series of numbers generated from the radar echos obtained when the radar dish sweeps the sky. The most common visual presentation from these numbers is something known as “reflectivity data”. There are several different types of reflectivity data based on what part of the radar scan information is used. As the radar dish sweeps around the sky, it makes a stepwise tilt up, sampling the atmosphere in layers, resetting eventually and starting the tilt cycle all over again. This happens because the dish focuses the beam, and it can only cover a narrow layer in each sweep. The reflectivity radar display you see on TV and on EWR represents a “stacked” composite of one or more of those tilt layers (indeed, one such full layer presentation is known as “composite reflectivity”). Other reflectivity presentations may use only the bottom few layers. This is done for two main reasons: one, to speed up the time it takes to obtain the necessary scan data, and secondly, to focus on and illuminate storm structure nearest the ground – the area where tornadoes form. These are the various “base reflectivity” scans. EWR uploads two reflectivity scan sets in the Scan B scans on our main page. The principal display that you first see, is a full composite reflectivity scan, composed of all layers currently being swept by the radar dish. This scan is the slowest to update, because it has to collect all layer levels before data can be sent out. If you click on any of the Scan B scans, you’ll see the first level Base Reflectivity scan (BR1) (you can distinguish it from the composite scan (CR) on our display by its black background). This scan shows only the first tilt level, and is important because it allows you to see the storm cell structure down where tornadic activity might be. The composite scan obscures this bottom detail by adding information from layers further above. Composite reflectivity scans give you a better sense of the size and overall content of the storm; base reflectivity scans give a better sense of the energy in the bottom layers close to where you live. In impending severe weather, get into the habit of switching back and forth between the scans. If tornado activity is possible, watch the base reflectivity scan (BR1) particularly – it will present more timely data, and show you the characteristic hook structure a rotating supercell (where the tornadoes usually are) takes on when it’s gearing up to drop tornadoes. The composite scan obscures this detail with rain reflections. Presenting these images is a bit of a visual art form. The US National Weather Service uses a colour scheme designed not only to show certain features, but to also be visible to those who have colour blindness issues. This compromises, to a degree, the extent to which the display can be used to highlight certain storm features. Our software, as is the case with others, allows us to design colour displays (“palettes”) for specific purposes. EWR has designed some high quality palettes for winter displays that are capable of giving a good indication of the nature of the precipitation, once some experience is gained in their use, and we’ve correlated the displays with actual weather observations to further fine-tune their accuracy. Winter is tricky. Snow can be difficult to interpret from radar displays because its less reflective, and its buoyancy in the air floats it around, confounding the radar’s ability to discern the cloud structure. However, we’re comfortable with what our winter and mixed precipitation displays can tell us. The next project will concentrate on summer storm weather. EWR will show a variety of different display palettes over the coming months as I explore how best to squeeze the most useful information out of the data. This data is a constant, and key display elements will not change – red into light purple in the display will still mean severe, potentially dangerous storm conditions (the light purple is an indication of a significant hail core). EWR alerts trigger at 60dBZ (strong echo return to the radar), well in the red zone. Red in the displays triggers at 50dBZ, and in any radar display, indicates that conditions have moved beyond merely strong to possibly severe, so caution is advised. Most of the palettes changes we will be playing with will be below the 50dBZ level. Active rain begins around the 20 dBZ level, but this is variable and dependent to a degree on local topography and conditions. I’m looking to fine-tune this region in order to provide a clearer picture of whether there is active precipitation or just heavy cloud. This is especially important when its desirable to separate out dangerous storm characteristics from just plain soggy weather. F0-F1 Tornado for Lambton County July 23, 2011? Probably. Environment Canada will make the official determination, but the radar evidence from last night suggests a small strong F0 and perhaps a weak F1 one was quite likely. A compact but intense cell crossed into Southwestern Ontario east of Sarnia about 7PM in the evening July 23, 2011. We watched the cell develop strong verticality over the next couple of hours with high hail densities evident high in the updraft. We noted an MDA event (“mesocyclone detection algorithm” – an automated detection of updraft rotation in a thunderstorm, converting it from an ordinary thunderstorm to a supercell) over this cell about an hour after it crossed the lake shore. The reflectivity radar trace indicated a large upper hail core. The overall presentation of the cell didn’t suggest a classic tornadic mesocyclonic cell. However, when we looked at the storm relative velocity profile on the lowest tilt we found the couplet (yellow arrow) shown in fig. 1. The couplet didn’t show on further upward tilts, indicating some degree of rotation was occurring near or at the base of the cell. Since the distance between KDTX and the location of the couplet is about 80 miles, the SRV couplet indicated a velocity disturbance around 5000 feet. Since the beam is narrow, and above the ground, it cannot determine how low the disturbance went. Figure 1. 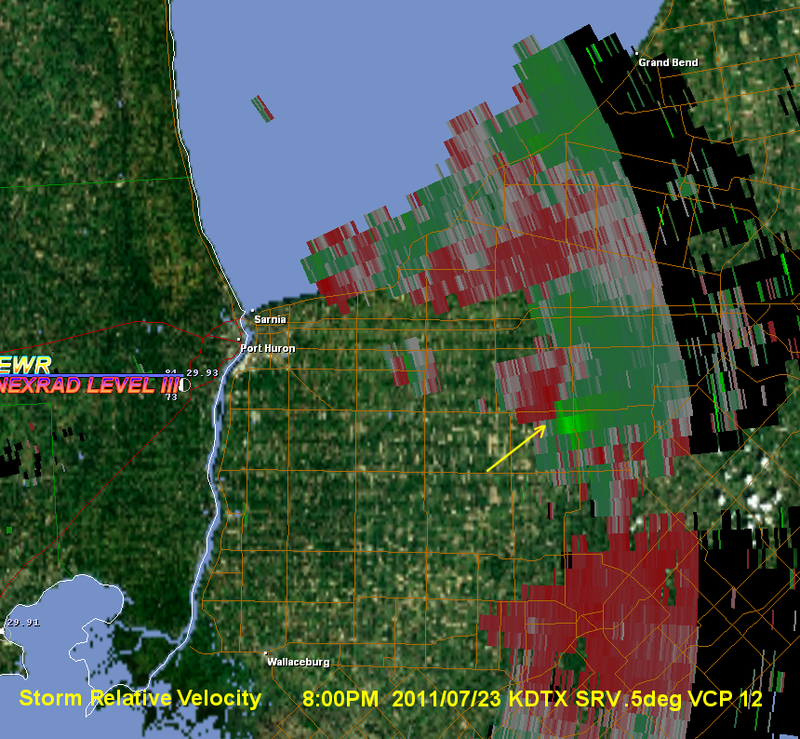 Storm Relative Velocity couplet, July 23, 2011, Lambton Co.
A velocity couplet in a storm relative velocity profile indicates a rapid change in the direction component of the velocity vector (velocity, by definition, is the combination of speed and its direction context). Storm relative velocity profiles measure changes within a wind profile, and therefore will show when there is a significant change in direction of wind, like occurs in a tight rotating air column). Though the scale is not shown in fig. 1, the wind shift in the couplet can be measured. The light green portion of the couplet measures to -44 knots, to +15 knots for the immediately adjacent red bin. This translates to a wind shift (rotation) occuring at approximately 120 km/h. This measured amount puts the event at the high end of the F0 scale (64-116 km/h and the low end of the F1(117-180 km/h) range. The couplet doesn’t indicate whether or not any rotation actually reached the ground. Damage evaluation will confirm further if the duration was enough to consider a full fledged low power tornado. The SRV couplet survived on the radar scan for more than one cycle, indicating the event would possibly have been in play for several minutes. Ephemerata Weather Radar is now back online. thanks to the benefit of going cable. EWR should be fully operational going forward. Since hydro costs are still climbing, EWR may still be offline when no weather is threatening, but hopefully gone are the midday drop-outs and stalled updates, and hopefully, the missed alerts. This spring was not pretty. It’ll take a bit to get caught up on some of the peripheral stuff like hurricane season now upon us and some of the other projects that were on the burner. Bell DSL failures have caused EWR to go offline for the time being. Update 2011-07-14: EWR is now back online with new internet service and revamped server garden. Update 2011-04-26: The unrelenting rains we’ve had this spring have just about fried the Bell’s local legacy trunk lines in this area and I cannot keep a DSL line sync’d up for more than a minute or two at a time. Since EWR and its network, even when down to one cpu, has multiple programs running, these sync outages leave many connect sessions hanging, and the router may or may not be able to re-establish a fresh PPPOE session and restart the ftp sessions. The end result is that EWR cannot, at this time, maintain the EWRWxAlert system when the network is unattended. For a while, forced restarts of the router were successful in re-establishing the sessions, but the sync stability has now gotten so bad, that even this technique is hit and miss. Therefore, until I can have lines replaced or change broadband service, EWR will only be operational when I can manually restart connect sessions. I regret any inconvenience to regular users. Where possible, the EWRWxAlert system will be in operation as weather occurs, and if I am able to manually monitor the system. Well, it seems I’m getting off to a good start at the beginning of this year’s thunderstorm season. The cell that just rumbled its way up from Lake huron *should have* triggered email alerts to subscribers both on the southwestern Ontario list and the GH-GTA list. But it didn’t. Well, it actually generated the alerts and they went to the first email address on each list, which is the EWRWxAlerts archive, then ended its distribution. It seems that some of the changes my ISP made over the winter to reduce spam in their email handling, also changed the way in which address list delimiters are seen in a distribution list. Long story short, it saw the first address in the list, but ignored the rest. I’ve now edited the list files and tested them, and subsequent alerts should now flow as expected. This would be a good time to point out that the alerts received by the EWRWxAlert archive are immediately flipped out to Twitter, and so if you are a Twitter user, follow us on Twitter (twitter.com/EWRWxAlert/), that way you’ll get the alerts anyway if the emailer doesn’t find you. Also, the manually output Evironment Canada warnings also go to Twitter, but those are not tied into the email system (no way to do that at the moment). I also have to mention that I am having *severe* issues with Bell’s DSL line again, and I may have to abandon it in favour of the local cable supplier, which is not my first choice, both from an expense perspective and a service perspective. But in the end, a dead broadband connection is of little use in the internet trade. Canada desparately needs to get out from under the CRTC and allow strong competitive broadband services. Bell’s self-serving interests in being the content provider as well as the distribution network is not working, and Canada’s broadband internet service continues to fail, as the physical distrbution network continues to deteriorate under Bell’s care.